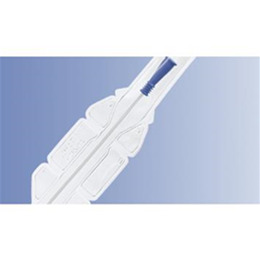 LoFric® Hydro-KitTM is truly an all-in-one catheter system. It includes a catheter with water and an integrated urine collection bag. Wheelchair users find it particularly convenient, and its collection bag also makes it ideal for bedridden patients in need of post-op bladder emptying. LoFric Hydro-Kit offers the freedom and reassurance to catheterize safely wherever the user is, whenever needed, whether toilet facilities are available or not. Available in sizes for men, women and children. Water sachet with sterile water. Fold and press to activate. Graduated collection bag, 1000 ml. Use the loop to hang the bag or insert your thumb to hold it. Emptying option. Tear to empty the bag. Option to separate catheter from collection bag.